Closely related to the lobster the langoustine is also known as Scampi, Dublin Bay prawn and even Norway lobster. Its white flesh is succulent and delicious, and while it’s prized everywhere it’s a particular favourite in Mediterranean countries. The langoustine catch is one of the most important for the Scottish fishing industry. Around our coasts langoustines live in sea lochs and open water, at depths ranging from a few metres to over 500m. Adults make burrows on the seabed, and are most active at night when they come out to eat. At Macduff we sell fresh and frozen whole langoustine and frozen shell-on and shell-off tails, each in a variety of pack sizes. Langoustine is wild-caught from the cold, clear waters of the North Atlantic, coming from a well-managed and healthy fishery. Langoustine is the most valuable shellfish landed in Scotland and over one third of total world landings are made here. 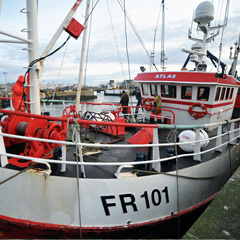 Langoustine is fished by trawlers, using a method known as bottom trawling, with smaller boats operating inshore and larger boats operating in mixed fisheries offshore. A small volume of langoustine, predominantly off the West coast of Scotland, are caught by creel. The langoustine catch is the most valuable fishery in Scotland, contributing around £80 million to the economy each year. Langoustine is landed at ports all around the UK but Fraserburgh - just ten miles from our plant in Mintlaw - is the biggest shellfish port in Europe and the base for many of the largest langoustine boats. That means we can receive and process the catch literally minutes from landing for maximum quality and freshness. We wash and grade them for size, then send them out as chilled or frozen raw whole langoustines. We also wash and freeze langoustine tails with the shell on, or remove the shell to leave scampi meat, which we freeze and sell in packs of various sizes. The langoustine fishery around the UK is subject to quotas, and catches are managed under the EU (European Union) Common Fisheries Policy. All catches of langoustine are strictly controlled and subject to TAC (Total Allowable Catch) regulations or national quotas. The main langoustine fisheries are in the Moray Firth, the North and East of Scotland and off the West Coast of Scotland. Over 38,000 tonnes of langoustine worth around £80 million are landed into Scottish ports each year. Preperation: Remove product from package and place in a plastic container and leave overnight in refrigerator to thaw. Drain any excess moisture and pat dry. Cook: Pre-heat non stick sauté pan over medium heat. Add a generous splash (1 Tbsp.) of oil and immediately add the tails. Gently sauté for 1 minute (Optional: add a spoon of garlic butter to finish). Preparation: Remove from packaging prior to use. Clusters are conveniently individually quick frozen and should not be thawed prior to use. Cook: (sauté) Pre-heat a pan over high heat. Add a neutral oil, such as Canola or Grapeseed. Place clusters in pan, being careful not to overcrowd (leave half-inch distance between clusters). Reduce heat to medium-high. Cook for approximately 4 minutes or until the internal temperature reaches 160°F. Add a morsel of butter during the last few seconds of cooking. Clusters are also great steamed, poached, broiled or battered and deep-fried. Whole Frozen Langoustines are quick and easy to prepare, requiring only a short blast of high heat in a skillet, wok or on the grill. To defrost Norway Lobster, place the sealed package in the refrigerator for 4-24 hours. Once ready, the Norway Lobster can be steamed, boiled or sautéed (to an internal temperature of 72 degrees Celsius / 162 degrees Fahrenheit). (no. of pieces per kg or per pack). Frozen langoustine tails, shell on and shell off.